Sporting Alexandria (Superleague) agreed terms with 25-year old American forward Nahshon George (206-91kg-93, college: Idaho, agency: Haylett Sports). 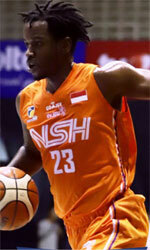 He played last season at Hang Tuah in Indonesian IBL league. In 22 games he was fifth best scorer with impressive 23.4ppg and averaged 12.9rpg (#5 in the league), 3.3apg, 1.7spg (in top 5) and 1.0bpg. George helped them to make it to the semifinals. Quite impressive season as he was named to Asia-Basket.com All-Indonesian IBL 1st Team and to the All-Star Game. He ended the previous (2017) season at Tijuana Zonkeys (CIBACOPA) in league where in three games he had 10.7ppg, 6.7rpg, 1.0apg and 1.0bpg in 2017 season. But the most of that year George spent at Thai General Equipment (TBL) in league. In 21 games he recorded very remarkable stats: 19.2ppg, 14.2rpg (#5 in the league), 1.8apg and 1.3spg in 2017 season. It was another spectacular year as he was named to Asia-Basket.com All-Thailand TBSL Honorable Mention.